In this section you will find out what exactly the program Tidy Start Menu does with your Start menu. To begin with, let us see what the Start menu actually is. Actually, it is a set of folders and shortcuts stored in a certain location in the operating system. Description: Computer shortcuts are small files containing only the location of another file. In fact, a shortcut contains little information so it is small. Shortcuts are usually stored on the desktop and have a small white square in the corner with an arrow on it. 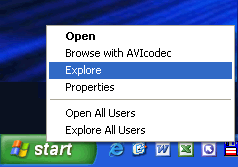 To access these shortcuts and folders, just right-click the Start button and select "Explore"
As you see, you can manually group items into categories in Explorer. All the program does is just copying or moving files to the necessary folders. But it is a simplified point of view. If you group items manually, you will have to do it in two folders: the folder common for all users and the folder used by the current user. Thus, you will have to do the job twice. Besides, the program uses a special interface that fits the process of grouping items into categories better than Explorer and has some additional features (import, export, etc.). That is why the program will allow even an advanced user to considerably reduce the time needed to group item into categories and then use this grouping again.